Instant Pot might be the hottest multi-cooker company out there right now in terms of buzz and hype, but they’re certainly not the only game in town when it comes to high-quality multi-purpose cookers. 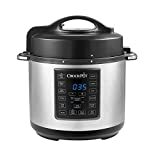 The Crock-Pot 6 Qt 8-in-1 Multi-Use Express Crock Programmable Slow Cooker is eight cooking devices in one, and we’ve found it to be even better than most Instant Pot models in our testing. That’s saying a lot, as anyone with an Instant Pot can attest to. The Express Crock is on sale at a $17 discount right now, so grab one while you can.